STOP HS2 | Will HS2 Hide Rocketing Budgets by Switching to Cost Plus Contracts? Anyone who wants to keep up with what is really happening with HS2 knows very well that, besides odd reveal in the mainstream press and the rare case where an FOI request actually gets an answer, you need to keep an eye on the trade press. This time it is the turn of Ground Engineering Plus to come up with the exclusive revelation that HS2 Ltd are considering moving from target price contracts to cost plus contracts. Simply, both those contracts work exactly how you would expect: ‘Target Price’ means a set of works is specified, and it is expected that the contractor will get paid that price; whilst with ‘Cost Plus’ it’s a bit more flexible, at the start a price may be mentioned, but the contractor gets paid however much they say the project ended up costing, plus an amount or percentage on top. 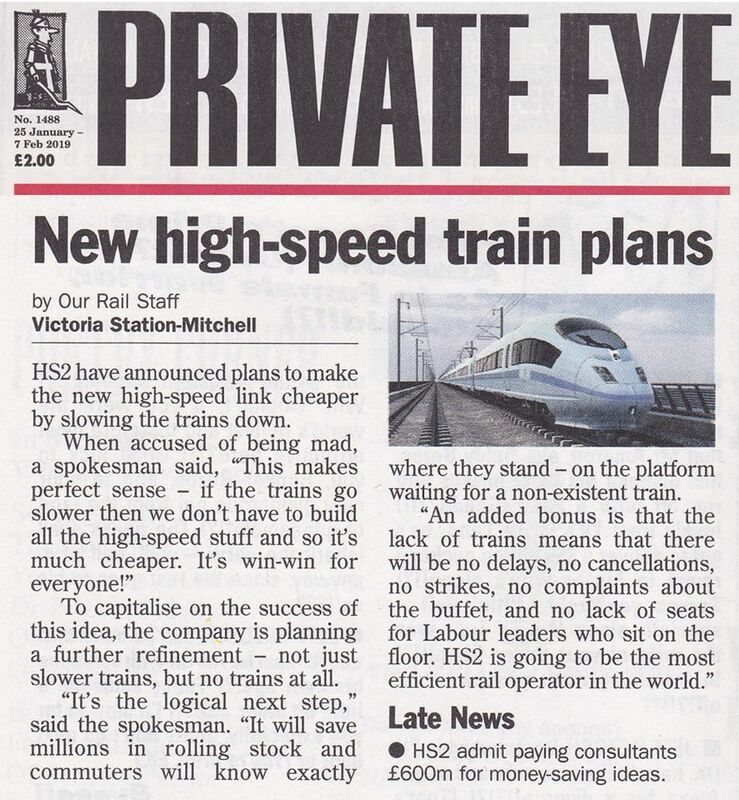 This has the advantage of making it look like HS2 hasn’t gone massively over budget until the bills come in years in the future, and is needed because it’s becoming clearer and clearer that HS2 cannot be built to spec for the current budget. From a contractors point of view, a ‘Cost-Plus’ contract handled correctly is a licence to print money, as you can more or less change for anything. For politicians this would also prove to be an attractive solution, as a clearly fictitious headline cost could be made up right now to get them off the hook, and any fall out over the final bill will be their distant successors problem, so long into the future that they will almost certainly be able to blame a different party of Government for the failure to control budgets, as well as anything else that went wrong. This whole thing is the legacy of not doing detailed ground surveys six years ago when they should have been done. Only in November did HS2 Ltd accept that geotechnical baseline reports (GBRs) are needed, and trying to get them completed in five months has been described as “carnage”. With Crossrail GBRs took two years to be agreed, whilst HS2 Ltd only agreed that they needed them in November and want them complete by April, which even discounting that the current wet and muddy weather makes this harder, is impossible. This is especially unlikely in Kenilworth and Burton Green as examples, where the surveys are not even expected to start until next week. Originally HS2 Ltd had said they didn’t want to bother with GBRs, despite the fact they are a fundamental factor impacting the price of civil engineering contracts, because they needed to rush HS2 through Parliament. This was of course completely backwards as you absolutely need baseline geotechnical data such as sub strata ground conditions and hydrology to inform design your choices, especially for example, when you are planning to build a nine mile tunnel through a chalk aquifer which has a globally unique geological structure and supplies drinking water to millions of people. The key issue, which Dr Haydon Bailey tried to make to both the Commons and Lords HS2 committees, is that the chalk at the depth in the Chilterns is not like the solid stuff the Channel Tunnel went through, it is fractured and faulted throughout. Basically it’s rubble that HS2 could well vibrate into dust if it runs at the proposed speeds. In the end, HS2 Ltd came up with the exceptional wheeze of saying that they couldn’t get their ground investigation work done because the landowners wouldn’t give access to the land, which brought with it the bonuses of not having to explain other problems with route and design, and getting away with adding a clause into the bill to make it illegal for anyone to ever refuse access to anyone planning a future high speed railway anywhere. Things came to a head this summer. Contractors came back to HS2 Ltd and said that what had been billed as £6.6bn worth of two-part design and build contracts would end up around £7.8bn, due to the risk involved in coming up with a design, without knowing what the ground conditions it’s meant to be built on are. As a result, there are still no final designs. This is also one of the reasons that recently we have recently seen repeated noises from within HS2 Ltd that the high speed trains might not be as high speed as previously billed, that there might not be as many of them, and why the vested interest lobbyists are trying to move the narrative to one of ‘regeneration’. The main problem HS2 Ltd faces on Phase 1 is that nine mile tunnel through the Chilterns Hills and that chalk aquifer that supplies drinking water to London, though ARUP identified many of the potential problems in 2009. There are plenty of places where HS2 will need enhanced structural strengthening that would materially damage the chalk and its capability as an Aquifer, a problem which due to the level of vibrations associated with the proposed speed would still be an issue if the railway was over ground, as it is on Phase 2 through the Cheshire Brine Fields. The sad reality is that ground surveys were never really needed in either of those locations, as if anyone had even looked at the reams of historical data, these areas would have been ruled out as unsuitable for a 225 mph railway before lines were even drawn on the map. On the eastern route through the Midlands and Yorkshire, it is genuinely incomprehensible that routes have been suggested in areas of visible subsidence, without any attempt to use ground surveys to see if there is a route that HS2 could safely be threaded through. All of this this means there are now those two options, reduce the speed of trains or accept that you will need significantly more expensive structural strengthening. This is why HS2 Ltd are testing the water to see which they are more likely to get away with, and why lobbyists are moving the narrative and getting ready to include more made up and speculative ‘wider economic benefits’ of regeneration in any future business case, to compensate for the hit the current justifications for HS2 will inevitably take. The other thing that HS2 bosses, and of course former bosses, have recently been touting in terms of a cost-cutting proposal is reducing the number of trains HS2 would run. This one hasn’t really made sense, until now. While downgrading construction components such as having ballast track, boring thinner tunnels or installing less reinforcement on the HS2 lines would lower the cost of construction, and have the knock-on effect of reducing the speed trains could run at, we were at a loss to see what HS2 Ltd could do to reduce construction costs that would have the knock-on effect of reducing the number of trains HS2 could run. Thanks to Ground Engineering Plus we now get it, as they are suggesting that one of the options HS2 Ltd are considering is removing a ‘crossover cavern’ at Euston. Whilst this could save £1bn in construction costs it would come at a much heavier price for HS2, cutting the number of platforms they would have from 13 to 6, permanently slashing the number of trains HS2 could ever run and completely undermining the claim that HS2 is needed for capacity reasons. No wonder proponents want to move the argument on to focusing on the potential regenerational effects of HS2……. 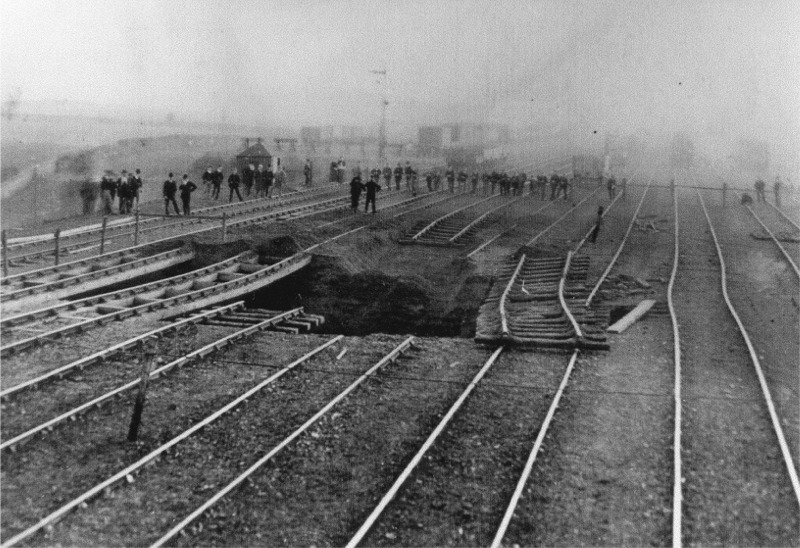 The HS2 Cheshire route – a long history of subsidence. 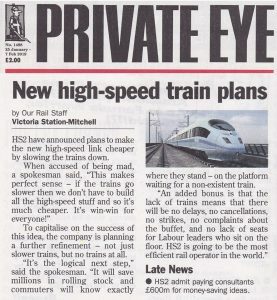 We all know, that HS2 encouraged/ more likely told by the Govt. to withhold any information that might damage what is laughingly known as “the business case”. Non disclosure agreements are a favourite ploy, targeted at most councils, most of whom appeared to have signed, thus betraying their council taxpayers. 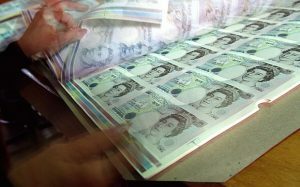 Encouragingly, many members of Cabinet have expressed their doubts on HS2, so with a possibility of a no deal Brexit, that might concentrate a few minds, together with the fact that the majority of funds spent has been on property acquisition, which could be reversed by selling the properties concerned. All is not yet lost!